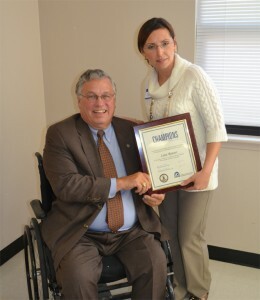 Lana Rauser (right) displays her award with Virginia Department of Rehabilitative Services Commissioner Jim Rothrock (left). Manassas, VA – Lana Rauser, an employment specialist with Didlake, Inc., has received a Champion in Making a Difference Award from the Winchester, Va., office of the Department of Rehabilitative Services. Rauser received the award because of her “commitment to assisting and empowering people with disabilities.” As an employment specialist, Rauser helps businesses place and train employees with disabilities. Rauser was one of two recipients of the Champion in Making a Difference Award honored at a recognition program on Oct. 16 at the War Memorial Building in Winchester.